Jesus The Radical Pastor: "Father, forgive them; they don't know...."
I have a good and thoughtful friend who is pondering the request of Jesus to the Father to forgive his enemies. Luke writes, "When they came to the place called the Skull, there they crucified him, along with the criminals—one on his right, the other on his left. 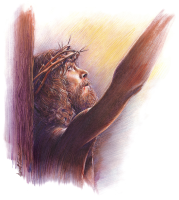 Jesus said, 'Father, forgive them, for they do not know what they are doing' " (23:33-34). The immediate context reports that the request is directed toward the Roman soldiers whose task it was to nail Jesus to the cross. The verse goes on to report that the soldiers gambled for Jesus' robe. Question: Did the Father hear and answer this request of his Son? Jesus does not say from the cross, "...nevertheless, not my will, but yours be done" as in Gethsemane. Here it is a straightforward request. Dare I say it was a passionate command? If the Father did forgive them, what do we do with the need for repentance before forgiveness? These hardened soldiers certainly aren't asking for forgiveness; they're simply doing their gruesome job. Did the soldiers unknowingly and undeservingly win a "get out of hell free" card at that moment? If the Father does not forgive them, what are we to make of Jesus' request to the Father? If the Father says "No" to his Son? Why? The Father and Son are not "one" at this point? It's not enough to make this a general and kind blanket request for forgiveness of the whole world, is it? That presents another mega-set of problems, doesn't it? Did the Father answer Jesus' specific request from the cross or not? Please comment. wow! this is the best post i've read... ever. now i will offer my humble musings on the subject. I think it's important to look at other places in scripture where Jesus uses similar command language. "Follow me and I will make you fishers of men" and at once they left their nets and followed him. in matthew 21:19 Jesus says to a fig tree "may you never bear fruit again!" and immediately the tree withered. in luke 8:54,55 Jesus says to a dead girl "my child get up!" and her spirit immediately returns. matthew 8:32 Jesus says to a group of demons "Go!" and they came out of the men. in mark 4:39 Jesus says to the waves "Quiet! Be still!" and the wind died down. so in all these instances we see Jesus command language garnering immediate response to his demands. not only do people immediately respond, but also trees, demons, wind and waves, and death. so what of his command for the Father to forgive those who know not what they do? I think you can believe that the command was granted, not just for the romman soldiers who physically nailed him there, but also for the sinners whose misdeeds led to him being nailed to the cross. what that means I'm sure could spark endless hours of debate and conversation, and I hope it does. otherwise, I think it's very interesting that while luke has him making this request of forgiveness, Matthew and Mark have him questioning God as to why he has forsaken him. Perhaps when Jesus made this command for forgiveness for the first time he didn't feel any power go out of him, which prompted him to ask in mark and matthew... "Eloi, Eloi, lama sabachthani!!?" My God, my God, why ahave you forsaken me?" My friend also noted that when God/Jesus speaks things happen, especially when Jesus uses imperatives. Good observations. I've always assumed the Father did answer Jesus' request. Also, I think that they were forgiven just for the killing Jesus, thus it's no "get out of hell free" card. I think only the offended party can forgive the offender, and since all sin is ultimately an offense against God, then I would think only God could forgive sin. But, if God (the Son) could forgive people just by the demanding of it, you have to wonder why He had to die. Does it help to consider Stephen's similar statement in Acts 7:60? If we sin, but do not know we are sinning, is the degree of judgement the same? at the very least, Jesus is showing compassion in that the soilders are simply following orders and do not know they are putting the Son of God to death. They are not committing a state crime, because it is their law. They are committing a crime against humanity, but how much of their worldview informs them of that. Essentially, they are committing a divine crime, which probably is the absolute worst offense, but they have no knowledge of that either. the request from Jesus seems to be that of compassion. i believe Jesus' death is the basis of all forgiveness, but why do you limit the request just for the act of crucifixion? Do you take the request, then, to be for those specific soldiers for that specific act? i agree that compassion is motivating Jesus' request, but is their ignorance of the 'divine crime' reason for the forgiveness? what do you think of melchizedek's idea? Yes, I've always taken the request to "be for those specific soldiers for that specific act." Or perhaps for all those involved in his death, but still for the specific act. I'm open to other ideas, that's just what I've always thought. After re-reading it now though, it doesn't appear clear who the "they" are. i'm still exploring what this request means, too. it touches on the grace of forgiveness and the interactions of Father and Son. Thanks for being part of the exploration. According to my college history professor (a learned if arrogant man), these particular words from the cross do not appear in the earliest manuscripts. I think we'd all agree that that doesn't necessarily mean that Jesus didn't say them, but it is compelling that "not know(ing) what they are doing" is not the basis for forgiveness elsewhere. The examples cited by Evan are all instances where Jesus is making command upon those things over which he clearly has authority. But does Jesus have authority over the Father? That's a rather discomforting notion. 1. forgiveness is given where it hasn't been asked for by the recipient. Given those choices, I lean towards #1, but I don't pretend to know whether this has God violating any of his own "rules" on how grace can be dispensed. Petition was made, and Christ was the focal point of it...so it covers the requirements on those grounds. It's just that Christ made the request instead of the recipient. Do we deny Christ that perogative? But then, where's the repentence of the guilty? Perhaps this is just a case of special dispensation to those who unwittingly helped to fulfill the climax of God's plan for mankind? ...though this still doesn't address the repentence issue. As to whether ignorance is justification for forgiveness: That's a very intriguing facet here, one which seems fraught with pitfalls. It feels a bit like the question of whether grace is given to those who have not reached their "age of accountability" (i.e., the salvation of infants/children). Perhaps there's some help in that debate. And maybe it addresses the repentence concern. Interesting. Upon reading that God was in Christ reconciling the world, I assumed that forgiveness was on His part extended to the world. Those who have not heard this good news need to hear it so that they can by faith recieve it. The battle is won. The lamb has been sacrificed and atonement was made. Is forgiveness only for those who can work the work of asking to be forgiven or is it the sincere acknowledgement of sorrow over our sin and agreement with the Triune God that we need a perfect Savor? As I said Interesting. Jesus said earlier in his life He always did that which He saw the Father doing. Perhaps this request torn from his heart came from out of His Father's torn heart. I don't know (of course). I'd say that maybe this forgiveness was granted for all Jesus prayed for, but surely through the work of the Spirit eventually, to bring each one of them to repentance and faith. I find it hard to believe that Jesus never prayed for the Jerusalem he ended up weeping over. And exclaiming that he had longed to gather them together, even as a hen gathers her chicks under her wings. But they were not willing. But if he did, God certainly did not answer that request! Like it or not. i like your last comment, "Perhaps this request torn from his heart came from out of His Father's torn heart." that the dilemma...if Jesus prayed and the Father didn't answer, what's going on in the Trinity? Geza Vermes has some good insights on this portion of Luke's gospel. He says the only indication this phrase was directed at the Romans is it's placement in the narrative, beside that it just doesn't add up, because A) The Roman's ignorance to Jesus divinity was obvious (and Luke was not one for pointing out the obvious, preferring to omit "who art in heaven" after "Father") and B) because this statement would have pointed to Jesus believing that Rome was responsible for his death (which may be, however it was not the position adopted by the early church.) So we are forced to ask why would the early church adopt a belief about who was responsible for Jesus death that was not shared by Jesus? Jesus never utter those words? Vermes also points out that since it was missing from about half of the earliest manuscripts it must have been a hot topic of debate among the early church, and true to form it continues to be today. Some hold that the Father turned his back on Jesus when he had taken on the entire sin of man, prompting Jesus to cry out asking why the Father has abandoned him. That Jesus even had to ask the question indicates that something was indeed missing in him. Perhaps that period of abandonment also included the point in time when Jesus requested the Father to forgive them for their ignorance. Perhaps that request was uttered not by the almighty Son of God, but by the impotent, sacrificial lamb of God? i was hoping someone would take notice of that suggestion. that's an interesting point about the thief too. i was wondering if there were any parrallels to be drawn there. this is truly a fascinating subject to me. Can you elaborate on what you mean by the ignorance part of the conversation? Are you saying that ignorance is a basis for forgiveness? i can't find anyone online who discusses the textual variant in the mss. Almost everyone comments on the phrase "Father, forgive them..." as if it's on solid textual ground. it's one of those sayings from the cross that has millennia of comments on it, i.e., no touch it. as i've search around i came across the scholatics who taught about two kinds of ignorance---the kind that you are still responsible for your actions (culpable ignorance) and inculpable ignorance (also called invincible ignorance) where you are not held responsible. Was Jesus saying that they were inculpably ignorant? Just because Jesus quoted Psalm 22:1 from the cross does not mean that God literally "abandoned" Jesus. While the words do express great agony, they may very well be a cry of hope because in Jesus' day to quote part of a Psalm meant you affirmed all the Psalm--and Psalm 22 ends in great triumph. I'm not sure what went on in the Trinitarian relationships while Jesus was on the cross, but I personally don't think the Father abandoned Jesus. Isa 53:12 Therefore will I divide him [a portion] with the great, and he shall divide the spoil with the strong; because he hath poured out his soul unto death: and he was numbered with the transgressors; and he bare the sin of many, and made intercession for the transgressors. So it was written to fulfill the scriptures. But were scriptures fulfilled when Jesus uttered those words, or did Luke include the words to show his readers that this was the man that Isaiah spoke of in Isaiah 53? Jesus is *interceding* for the transgressors by his request. If the words were included by Luke to show the fulfillment of Scripture, I choose your second option. Hi all! I'll throw in some thoughts too. First, you might find some good thinking on this very prayer/command (btw, the first three 'requests' in the Lord's Prayer are also imparatives) in Robert W. Jenson's "Systematic Theology" Vol. 1 chpt. 11 "Crucifixion." One very significant insight that Jenson brings forward in my mind is connecting this prayer/command to the parable of Jesus told a few days before his crucifixion recorded in Luke 20:9-19 (and par). Those Jesus was addressing got the point of the story and before the week was out had indeed carried out their plan not only to aresst but to kill Jesus. What Jenson points out is that as the parable was being acted out in the real world of first century, when it came to the point, Jesus, the Son, instead of calling for the Father/Owner to avenge his death and the abuse of his predecessors, instead calls for forgiveness... Something completly out of line with both his own conclusion (Matt 21:40-41) and/or the conclusion of the people who heard the parable (Mk 12:9; Lk 20:15-16). Astounding at the very least, but more likely extreemly offensive to our human sensetivities as demonstrated by even how beyond us who have expereinced the UNDESERVED forgivenss of the Father- still even we refuse to beleive that a cosmic event has taken place here that could in the End reconcile and restore ALL creation! This is a very thought-provoking post. But God did deny Jesus at least one request--the request that the cup be taken away. What exactly is Jesus' authority in relationship to the Father? I think he prayed this to intercede for them - that the Father's wrath would not fall immeidately. I do not think it applies to unrepentent (unsaved) sinners who have rejected the gospel. I liked this thought What Jenson points out is that as the parable was being acted out in the real world of first century, when it came to the point, Jesus, the Son, instead of calling for the Father/Owner to avenge his death and the abuse of his predecessors, instead calls for forgiveness... Something completly out of line with both his own conclusion (Matt 21:40-41) and/or the conclusion of the people who heard the parable (Mk 12:9; Lk 20:15-16). Of course He forgave them! Your post makes me think of a simple question I had asked a while ago in my blog and never got a straight answer from anyone... "IS GOD FREE?" Protestants, as far as I can see, have God bound to a strange set of "universal laws" that are stronger than God himself. God wants to save you, but he can't if you haven't repented. So is God free? They say that since God is both loving and just, his "justice" attribute does not let Him do the saving He wanted with his loving attribute. It's all nonsense talk to me. Is God free or not? It's the saddest of God views I've learned. The protestant God that's bound by laws greater than even himself. No wonder many modern day christians are not free. How can you be free if your God is not free? Is God free? That depends on the definition of "free". Is God free to commit sin? Is he free to inhabit Hell? Maybe, but I hold that he chooses not to. In fact, if you hold that Hell is by definition a place that is completely devoid of the presence of God, then it would be impossible for God to inhabit Hell, wouldn't it? Yet aren't all things possible with God? Does this make him not free? God declared that Jesus is the one way to salvation. Once declared, can there then be any other ways made? Is God free to change his mind? I think scripture shows examples of him being pursuaded away from previous positions/plans. But I prefer to think that he would not create ways to salvation that don't require repentance through Christ, as that would make Christ unnecessary. Even a waste of time and effort. I see God as free...free to set restrictions, even upon himself, as he freely chooses to. But none of those become "greater" than him. Those restrict him only to the extend of his choosing. He is always totally in control. Nothing is above nor greater than him. So, is God free? No, he comes at great cost! Can he change his mind? You say yes, but you'd rather think he won't? I think he's free. Free as in freedom. And by the way. Christianity is not about repentance or about hell. It's not a waste of time or energy. As far as the comment that when Jesus commands, people follow.. Well there is Judas..
Not to mention, why do you think the fishermen dropped their nets and followed immediately? One rabbi said, "Under the age of six we do not receive a child. But from six upwards, accept him and stuff him with Torah like an ox." According to tradition, a drop of honey is placed on the first page the child is to learn to read; he kisses it, thus beginning an association of pleasantness which is expected to last throughout life as his education continues. Hebrew education was divided into stages. The first stage is called Beth-Safar. This was for kids aged 5 or 6 to age 10. During this time, the children would memorize the Torah. You remember, the Torah consists of the first five books of the Scriptures; Genesis, Exodus, Leviticus, Numbers, Deuteronomy. We make our kids learn the books of the Bible. They learned the five books by heart. To them, the Scriptures were the most important thing. It is not a matter of ability, it is a matter of what we think is important. The next stage of Jewish education is called Beth-Talmud. This is for those aged 10-14, here, they would memorize the Psalms, Proverbs, Ecclesiastes, Song of Solomon, Daniel, all the rest of the Hebrew Scriptures. So the by the end of age fourteen they had the whole Old Testament memorized. Jesus was at this stage when His parents lost Him in the temple. And, there He is found talking with the rabbis in a series of questions and questions and answers and questions. He is questioning them on Scriptures; back and forth. They are amazed at how he can process information and questions them. The next stage of Hebrew education was only for the best of the best. These were for those who applied to Harvard or Yale. This happened at age fourteen. If you didn't do well in Beth-Talmud, forget getting into Harvard or Beth-Midrash. Beth-Midrash was for those aged fourteen and above, and they were to start to study the oral and the written laws, all the things the rabbi had written and said, they were beginning to memorize and process and they would have passionate discussions about it. This is where they studied the oral and written law. This is where you would discuss what different rabbis said about the law and how they interpreted it. Somebody might say, "Well, rabbi so-and-so said that to honor the Sabbath you could only walk as far as the local synagogue on Sabbath." And somebody else would say, "Well, but rather rabbi So-and So says that you can walk twice that far so you are able to get back home." But then somebody else would say, "Rabbi So-And-So says you can't walk to the edge of your village unless you're going to a synagogue in another village." They would get passionate about which rabbi interpreted the law the best. They got passionate about it because these were the things of God. In fact, that is how their worship services went. They didn't just come and listen to a preacher get up here and spout off, they listened to him read the scripture and then they would passionately ask questions back and forth, and get heated about it, because these were the things they loved to talk about. They believed the highest form of worship was study. You can see that each rabbi said something different. Each rabbi had their own way of interpreting or living out the Torah. Each one had their own added commandments and regulations. In fact, a rabbi's own particular interpretation of the Torah was called that rabbi's "Yolk." When you studied with a rabbi, you would take their yolk or their interpretation of the Torah upon you. But Jesus said, "My yolk is easy. I'm not about endless rules and regulations!" So when Jesus came among us as a rabbi, He didn't just pull these phrases out of thin air. This was how rabbis spoke. "Hey, my yoke is easy. Take it upon you. My burden is light." So Rabbis would have discussions with their students, they would take a particular command, like the Sabbath, and might ask, "What does it mean to honor the Sabbath?" And a student might answer, "I think it means to sit around and do nothing and have a boring day." This student is, of course, wrong. So the rabbi would say to the student very passionately, "No! That's not what it means. You have abolished Torah!" But if a student answered, "It means that we spend a day that we are reminded that we are no longer slaves, that we were brought up from the kingdom of darkness, that we are redeemed by the blood of the lamb. And we take one day a week to remind ourselves that our worth does not come from making bricks but from the one who made us." At this point the rabbi would say "Yes, my student! You have fulfilled Torah!" Jesus came and said, "I did not come to abolish the Law, I came to fulfill it, to show you what it really means to keep the law, to show you what it looks like lived out in flesh and blood." This is what took place at Beth-Midrash. This is the position that every good Jewish boy wanted to be in. To become a rabbi, or a teacher, was the highest honor to be had. If it were that way today, our teachers would be paid a whole lot more. So, at age 14, you would go to a local rabbi, one you highly respected, one whose yolk you wanted to take upon you. So you would say to the Rabbi, "I want to become your disciple." Then the rabbi would begin to quiz you and find out how well you knew Torah. He might say, "Give me in the book of Habakkuk the four references to Deuteronomy, in order." And you'd better have them just like that. Or he might engage you in what are called "Remezes." He would quote to you a verse on the subject he was talking on, and you would not have the Scriptures in front of you. You would have to realize, "Is he actually referring to the verses following the one he quoted, or the verses before?" And you would have to figure it out based on the context. "Does he really mean this verse instead of that verse?" And then you would answer him with another remez and the rabbi would have to figure it out. "Did you mean the verse before or after that?" You're supposed to know the Scriptures so well that you could figure it out. Does it sound complicated? It was! If they had done this in Seminary, I would still be there. Have you noticed that sometimes, when Jesus preached, the leaders wanted to kill Him? What was so offensive? Sometimes, Jesus spoke to the rabbis in Remezes. If you look back at what He said, like in Matthew 15, He quotes Isaiah 29, but if the leaders listened to the quote and thought about what the next few verses said, they would know that they had been nailed. They would hope that the common bystanders would not be educated enough to know what Jesus was really accusing them of. That is why it is helpful to read the context of the Scripture that Jesus quotes. Now, if the rabbi, of whom you wanted to be the disciple of, believed that you had what it takes, he would say, "Come, take my yoke upon you." This was the highest honor in the days of Jesus. So, somewhere around the age of 14, you would leave everything; Parents, Synagogue, Community, the family business, and devote your life to following this rabbi everywhere. The goal of a disciple was to be exactly like his rabbi. You would spend your whole day following the rabbi everywhere. Every detail of the rabbi's life was copied, even down to how he chewed his food. You were interested. "I want to look like him. I want to be like him, every step f the way." That is the detail to which a disciple wished to be like his rabbi. There is a phrase in the Mishna that says, "May you be covered in the dust of your rabbi." The idea was that if you followed behind your rabbi on the dusty roads, you would get covered in his dust. Meaning, you were following his so closely to be so much like him that you are glorified to be covered with the dust he left behind. That is how close a disciple wanted to be to his rabbi. Now, if you're going along the road with your rabbi, the rabbi's job is to teach you, and to test you. He might quiz you along the way and he might decide that you know the Torah really well, but there's something about you. Maybe your character, habits of something, where he says, "You're never going to be just like me." And you knew the bad news was coming. You are about to be expelled. To be expelled was horrible. He'd try to be nice about it. "It's obvious you know the Scriptures very well, but go and have some children. Maybe they will become rabbis. Go and ply your trade." In other words, "Go back to the family business. Your father is a fisherman, go learn to fish. Go ply your trade." Now, with all this in mind, look at Matthew 4:18. As Jesus was walking beside the Sea of Galilee, He saw two brothers, Simon called Peter and his brother Andrew. They were casting a net into the lake, for they were fishermen. Why are they fishermen? They didn't make the cut! They were not good enough. They were learning to ply their trade. A rabbi had not taken them on. Jesus goes to the losers, the rejects, the misfits, and He calls them! That's rather humbling. Now I know why I'm here. He goes to the losers. He says, "I want you to do it." Now, let's continue. Matthew 4:19-20. "Come, follow Me," Jesus said, "and I will make you fishers of men." At once they left their nets and followed Him. Have you ever wondered about this text? These guys just drop everything and followed Him at a few words from this Rabbi. Jesus is a rabbi and He's calling disciples. They are not good enough and yet a rabbi wants them! He thinks that they can actually be like Him! He thinks that they can do it! And so of course they drop what they are doing and they follow the Rabbi." 1. Is ignorance a basis for forgiveness? 2. What would it mean for God to forgive those crucifying Jesus? 3. Who is Jesus asking the Father to forgive? For as many answers has have been given, the text frankly just doesn't say. The answer lies in the Greek. The Greek word that Jesus uses in 23:34that we translate "forgive" is "aphiemi." It has a wide range of lexical meanings - including forgive. But another common use of the word is "permit." For instance, in Mark 10:13, Jesus says "Permit [aphiemi] the little children come to me and do not hinder them..." Same word that he uses on the cross. If we take the Greek word aphiemi, then, to mean permit rather than forgive, all the problems and questions with the text are cleared up. The greatest injustice the world had ever see was being carried out against the very Son of God. One can not imagine anything causing the wrath of God to rage more than seeing wicked people nail spikes through the hands of his sinless, beloved Son. And so as it is happening, Jesus turns to his Father and says, "Father, aphiemi them, permit them. They don't know what they're doing. Let it happen. I'm not calling down the furry of judgment upon them. Let it happen. Don't stop them." Incidentally, Luke 23:34 in the NIV reads, "Jesus said, 'Father...'" The word "said" is in a Greek tense that implies an ongoing action. It is more accurately translated "Jesus went on saying..." or something like that. He did not just once make the request that someone be forgiven, rather, as he was being crucified, he repeated over and over again, "Father, permit them... Let it happen..."
This understanding eliminates all the speculation about who Jesus wanted to forgive, his basis, did it happen and so on. Further, it reminds me that at any moment Jesus could have brought everything to a halt. He wouldn't have even needed to call those 10,000 angels - it could have just stopped. But it didn't. He went to the cross to willingly lay down his life for his sheep. There is no duality. The bible and the teachings of crist (a person) are metaphors to guide people to a more enlightened state. My freinds if really meditate on the saying of Christ , He knew the redemption plan of God was to be accomplished by 3o'clock that day. The Bible says that when we were yet sinners Christ died for us. Bible says God is love. Imagine if God's wrath was to fall on the people who were mocking Jesus. They could have been swept away in a fraction of second. Even today he is sits at the right hand of the Father and intercedes for all the sinners. The prayer of Jesus at the moment implies that he asks God to give them the chance to be cleansed by the Blood he shed and the sacrifice he made on the cross. The Bible declares "The Message of the cross is foolishness to the world but unto us it is the power of God unto salvation"
Jesus asked the father to forgive them for the sin of his death, when judment day comes "that sin" of those people putting Jesus to death will be forgiven, when the book of life is opened, "That sin" will not be in it for those people that caused the death of Christ. Very thought provoking question "if Father listened to Jesus Christ". I will illustrate this with an example. If my daughter does some mistake, I can loose my patience. So there are consequences/time-outs. She realizes her mistake so she asks me if I will forgive her. Well, being a father (generally rational one), I tell her I forgive you. I ask her, What would you do to assure me that you will not repeat the mistake (at least deliberately). I have forgiven her but also let her know that she has to be cautious. Going back to what Jesus Christ asked, its answer can be found in Acts 2, when Holy Ghost descended on the day of Pentecost and Peter along with other disciples preached. People were pricked in their hearts and they asked the question what shall we do. Peter answers them in Verse 38: "REPENT". See we have to be sorry to be forgiven. If you're not sorry, then you think you're not wrong and so you don't need forgiveness. Then he continues in the same verse, "Baptize everyone (no exclusions) of you in the name of JESUS CHRIST (who really set this forgiveness for us on the cross) "for the forgiveness of sins". He nailed his forgiveness. All we need to do is "Repent and get Baptized in the name of the Lord Jesus Christ. The verse 38 concludes "You shall receive the gift of the Holy Spirit." He not only forgives but gives us a comforter and a guide to live righteous life. May God bless you. He was speaking to his future self. Knowing his words would be recorded, when he his born again in this world. A little secret for you all, from someone who knows him. At that moment the sins of the whole world were forgiven. To benefit from that forgiveness, just believe it. Did it ever occur to anyone that Jesus was not referring to the guards or the people that were jeering at the foot of the cross? Why would Jesus ask Our Father to do something that He had planned to do since the beginning of time?Jesus knew that if they repent and confess Him they would be forgiven...sooo think about it in His dying moments why ask the Father for something He knew was going to be done?? I leave you with this...go back to Leviticus and read the book well...then read (all) of the accounts of what led up to the Crucifixion...and then tell me...who do you beleive Jesus was referring to...?? Peace, Light, Blessings and Love To All! God's forgiveness is a gift. If those with hardened hearts don't repent then they won't be forgiven. ,Romans or the angry disbelieving mob. Isaiah 53:10 tells us that the suffering servant would give himself up as a guilt offering. If we look back into the book of Leviticus (Chapters 1-7) at the five sacrifices ordained by God we see that three were voluntary (Burnt,Peace,Meal) and two were compulsory for sin of the people (Sin,Guilt). We can see from scripture that Jesus filled all five catagories but I am focussing on the guilt offering at this time. The person for whom the guilt sacrifice was offered had committed a sin against God unknowingly and the priest would assess the value of the sacrifice to be given. He would offer it on behalf of the sinner and pray to Almighty God that this sin would not be held against them; in fact that they would be forgiven for the sin and that it was committed unknowingly. "While we were yet sinners Christ died for us". No one on earth is responsible for killing Jesus. He told Pilate that He had the power to lay down His life and take it up again. Pilate was a mere human agent bound by his space and time in history. He had no power over Jesus the Christ. Then His office of KING commenses. He was PROPHET during His earthly ministry/ He is HIGH PRIEST now for us at the right hand of the Father/ He will be KING at a futre time ordained by the Father.